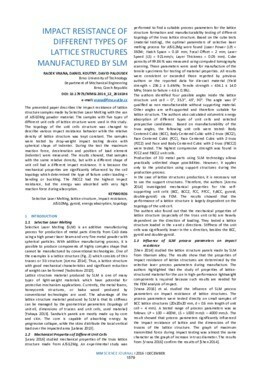 The presented paper describes the impact resistance of lattice structure samples made by Selective Laser Melting with the use of AlSi10Mg powder material. The samples with five types of different unit cells of lattice structure were used in this study. The topology of the unit cells structure was changed to describe various impact resistance behavior while the relative density of lattice structure was kept constant. The samples were tested by drop-weight impact testing device with spherical shape of indenter. During the test the maximum reaction force, deceleration and position of load element (indenter) were measured. The results showed, that samples with the same relative density, but with a different shape of unit cell had a different impact resistance. It is because the mechanical properties are significantly influenced by the cell topology which determined the type of failure under loading – bending or buckling. The FBCCZ had the highest impact resistance, but the energy was absorbed with very high reaction force during absorption.